As we know there are different types of recycling, paper recycling is the prominent among them. Here we discuss about what is paper recycling, the process of making recycled paper, advantages or importance of recycling and moreover, certain facts about paper recycling. 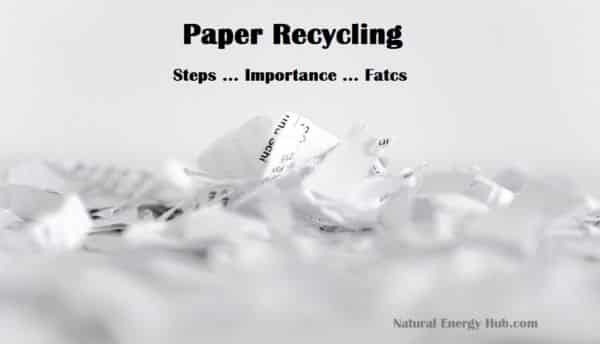 Paper recycling is a process of making new paper out of old paper. This can be further defied as a process of reprocessing scrap paper for reuse. Paper is one such material that can be easily recycled. Waste paper is usually obtained from paper mill scrap, old newspaper, magazines, telephone directories, time cards, post it notes, manuals, discarded waste paper materials, notebooks, textbooks, flyers, wrapping materials, booklets, office paper, newsprint and cardboard. All these can be recycled to make new paper. The first recycling of paper took place on after World War 1 in the United States. Its importance increased soon after World War 2 and slowly started gaining popularity. This soon spread to other parts of the world. Now in the modern world nearly 75% of paper is being recycled as per the study. Mostly all types of paper can be recycled except a few like paper towels, brown envelops, coffee cups, carbon paper, pizza box, craft envelop, tissues and candy wrappers which cannot be recycled. Paper recycling is a huge and lengthy process which involves a number of stages. These steps include collection, transportation, sorting, processing into usable material and new paper making. Collection : This is the first step in paper recycling. As the name suggest waste and used papers are collected from the scrap shops and collecting bins. This is the raw material for the production of new paper. Transportation : This is the second step in the recycling process. All these collected material are transported to the respective paper recycling plants in containers. Sorting : This is the third step in the recycling process. Now the paper is sorted in groups like cardboards, newspaper, newsprint, computer paper, magazine paper, and notebooks and so on. Each type of paper is recycled in a different way. Pulp making : here the paper is made into a pulp. For this the machines finely chops the paper. To this water and chemicals are added and heated. This makes it easy to break down the paper into paper fibers. Now finally the mixture turns into pulp or slurry. Pulp screening and cleaning : The slurry or pulp obtained has to be properly cleaned to remove all sorts of contamination. This process is done by allowing the pulp through screens with holes of different sizes and shapes so the bits of plastics will be removed. Now again the pulp is spun around huge conical shaped cylinders so that heavy contaminants like staples and pins will be removed. De-inking : after the cleaning process, ink is removed from the paper fibers. This process is called de-inking. Sticky materials like adhesives and glue can also be removed in this process. De-inking is done through shredding by adding chemicals. Water is used for removing small ink particles and larger ink particles are removed through a process of flotation using air bubbles. Refining, color stripping and bleaching : now the pulp is aggressively beaten so that these paper fibers swell. If it is to be colored, color stripping chemicals are added. Brown paper is obtained in this process. To produce white paper, oxygen and hydrogen peroxide is bleached with oxygen in the pulp. New paper making : This is the last and final stage in paper recycling process. Now the treated pulp is ready to be used in the making of new paper. Here the pulp is again churned with wood fibers to make it more smooth and strong. After this, water and a few more chemicals are added and this mixture is fed into the paper making machine. After a while, these paper fibers bond together to form a watery sheet. These watery sheets are quickly moved along press rollers so that excess water may be removed. The final product is made and it comes out as freshly manufactured paper. Reduces cutting of trees : As we all know, trees are used to make paper. It is the raw material to make paper. So if more paper is recycled, the fewer trees will be cut as recycling uses available and scrap paper as raw material. Not even a single tree is cut for recycling process. This is a big difference to the environment which in turn reduces the impact of global warming, protects the soil from soil erosion, preserves resources and protects the biodiversity. Reduces waste : If paper is not recycled, this would get accumulated in the landfills and the amount of waste would increase considerably. Job opportunities : As recycling is a lengthy process, a lot of job opportunities are created right from picking up old papers to transportation of new papers. This in turn increases the standard of the living of the community as a whole. Saves energy and water : More energy is used in making paper out trees than from recycling paper pulp. It is calculated that if one ton of paper is recycled, it saves energy that can be used in a home for 6 months and saves water about 7000 gallons. Reduces green house gases : Since paper is biodegradable, it automatically decomposes in the landfills. But on the other hand it releases methane and carbon dioxide which are deadly green house gases. Carbon di oxide is also released by burning and processing of wood to make paper pulp. More carbon dioxide is produced than what can be absorbed by the trees. So if fewer trees are cut and more paper is recycled, green house gases can be reduced considerably. recycling newspapers could save 250 million trees each year. 17 trees, 350 gallons of oil, energy and 1000 gallons of water can be saves if 2000 pounds of paper are recycled. a paper can be recycled for about 7-8 times till the paper loses its strength. recycling a day’s worth New York Times can save up to 65,000 trees. half a million trees are cut down just to produce weekly Sunday paper and its supplement. every ton of paper recycled saves more than 3.3 cubic yard of landfills. To conclude, paper recycling is a boom to the environment. The entire economy and the environment are benefitted through this process. Recycling industry is an asset to the economy. Steps should be taken to see that more and more paper reached the recycling industry. General awareness should be imparted so that more people will be aware about the benefits of recycling. More technical advancement is needed in this field as this recycling is a long process. More industries should be set up to recycle paper. This in turn will be more economical. Thus lets all promote more recycling to save mother earth.